The demonic actor Klaus Kinski is at his fearsome best in Werner Herzog’s atmospheric dark tribute to W.F. Murnau’s classic Nosferatu. Herzog turned Dracula into a taciturn and tragic vampire, whose blood-thirsty nature is acknowledged too late by junior estate agent Jonathan Harker (Bruno Ganz). 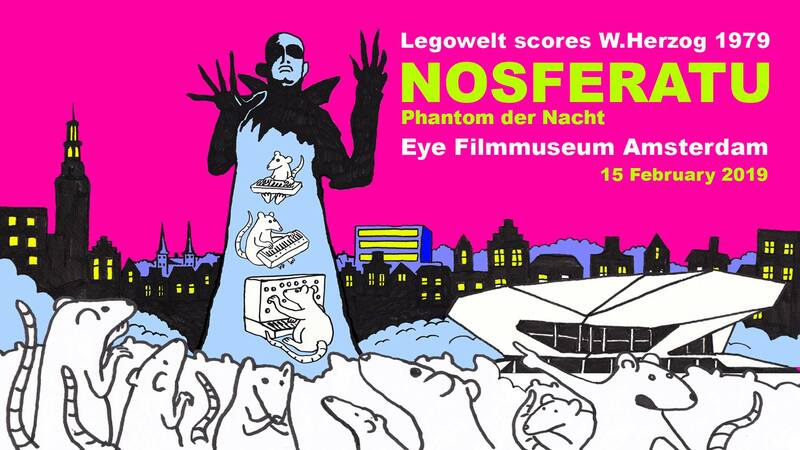 The acclaimed electronic musician Legowelt Music performs a horror score he wrote himself. Harker (Ganz) leaves for desolate Transylvania with a small keepsake portrait of his beloved young wife Lucy (Isabelle Adjani), to assist Count Dracula in the acquisition of a dilapidated property in the German town Wismar. When he sees her portrait, the Count immediately falls for the beautiful Lucy. Outside, the wind is howling and so are the wolves, Dracula’s favourite children of the night… Jonathan is powerless to act as Dracula makes his way towards Wismar along with a dozen coffins filled with death, destruction and thousands of rats. Werner Herzog’s tribute to the horror classic was partly shot in Delft and Schiedam, where rats were sent coursing down the streets. Kinski – it was Herzog’s second collaboration with the fiendish actor following Aguirre, der Zorn Gottes (1972) – grabs the limelight as the taciturn and tragic vampire. Legowelt Music is celebrated in the electronic music scene and a key figure in the Dutch West Coast Sound and the Intergalactic FM radio station. Legowelt’s music projects bewitch the listener and are rooted in the world of American House and Techno pioneers and fantasy and science-fiction cinema.